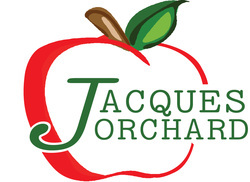 Gary and Lynne Jacques have a family run orchard in Hemlock, Michigan. We have over 20 varieties of apples including the popular HoneyCrisp. Our 2000 tree orchard also includes peaches, pears and plums. We grow asparagus, strawberries and vegetables. We produce our own jam, jelly, caramel apples and cider. Our mission is to grow quality fruit and vegetables for our customers! We are pretty much done with apples for the season- some Ida Reds and Granny Smith available for a short time. Come see us at the Holiday Market at the Old Township Hall (white building at 218 Elm St.) in Hemlock Friday November 30 from 4-7pm. We will have caramel apples, donuts, jams, apples and lots of other great vendors! There will be a wreath raffle at 6:30-the local businesses have made beautiful wreaths! Tickets available at local businesses and at the holiday market. Thanks to everyone that came out to see us here at the orchard or at the farmers markets! We appreciate everyone's support! WE HAVE JAM AND JELLY AVAILABLE NOW! CONTACT US. cell 989-751-6751- we can't always get to the phone but we will call you back!